Christopher Nolan has become quite the "it" director these days, or at least within geek (and critic's) circles. And it's a pretty fair assessment given his contribution to the movie industry, even if at times people feel his movies are a tad high brow. Now his work with the Batman franchise has been especially interesting given how he has pretty much executed a masterful reboot of the franchise that feels a lot like what Year One did for the comic book Batman. Taking on a somewhat grittier and yet also more realistic approach to the character that still left him larger than life and yet also very human. I don't think any of us could have accurately predicted where he'd take this iconic character nor how successful his Batman movies would become. And yet here we are with the third and final installment of his cinema masterpiece and it's certainly been a wild ride. And this movie is definitely quite the pay-off for the past 7-ish years of living with Nolan's Batman. Synopsis: The Dark Knight Rises is the third comic book movie in Christopher Nolan's Batman movie franchise. As with the other two movies, the screenplay was created by Nolan himself together with David S. Goyer. It has been 8 years since the events of The Dark Knight and Gotham is experiencing a new era of peace. The death of district attoryney Harvey Dent became a springboard for what would eventually become to be known as The Dent Act - a law that provided more stringent rules for law enforcement that has led to the arrest of many, many criminals. At the same time, it has been 8 years since the Batman has appeared in Gotham, given how it is common knowledge that he supposedly killed Dent. At the same time, even billionaire Bruce Wayne (Christian Bale) has disappeared from the public eye after a seemingly disastrous venture into clean energy technologies through fusion. But now there's rumors of a new international mercenary called Bane (Tom Hardy) is organizing forces around the world and in the city of Gotham for some mysterious purpose. Also, a highly skilled cat burglar named Selina Kyle (Anne Hathaway) manages to steal a precious item directly from Wayne Manor and escapes from Bruce himself. Commissioner Gordon (Gary Oldman) does his best to track down the leads related to the villain Bane and it seems his biggest supporter of his efforts these days appears to be a beat cop by the name of John Blake (Joseph Gordon-Levitt). Now the movie's pacing has a considerable bit of build-up - something that we've seen in other Nolan movies but may prove somewhat annoying for many movie-goers. As much as one has to appreciate just how much Gotham has changed since the Batman has gone into "retirement". 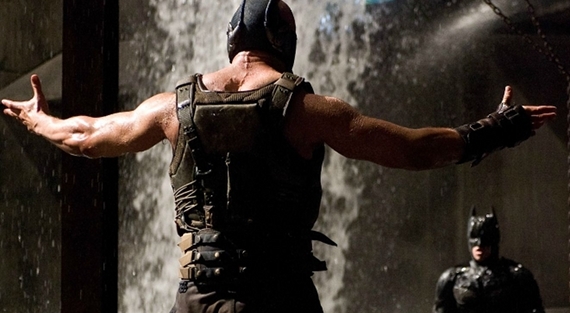 Plus we also need time to get to "know" Bane and just how dangerous a villain he is. Like the Joker before him, he's more than just your typical criminal and he's certainly going to escalate the entire sense of conflict to a new level. And Tom Hardy certainly represented him with an almost disturbing degree of physicality that definitely proved that he's more than a worthy adversary for the Batman. At least he was a heck of a lot more than a guy in a Mexican wrestling outfit. One could definitely detect that effort was put into making Bane a bit more intelligible. While it would have been rather realistic to have a person's speech to be highly muffled by the type of mask that Bane wears, it also would have made for a rather bad movie experience. It was reported that they had to go back and tweak his dialog after the initial teaser was not received too well and thus in the final cut it felt like Bane's track was distinctly different (and louder) than everyone else's. The movie is certainly one with heavy cerebral and psychological elements, as is to be expected from a Nolan venture. Although even I have to admit that I wonder if he really had to go to the lengths that he did to tell this story. It's not that his concept didn't work - it's just that I feel it could have been a bit more streamlined at times. 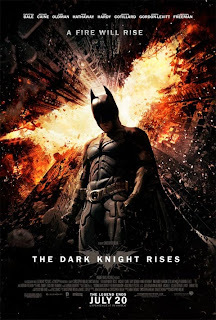 The movie was certainly a tad self-indulgent in that regard and it took a while to present the entire build-up to Batman eventually "rising", to borrow the term that sort of defines the movie. I still feel The Dark Knight was a better movie on its own, however The Dark Knight Rises had a lot more to accomplish than just a sequel. In fact this movie had to wrap-up the entire franchise in a manner that left us viewers ready to leave the Nolan version of the Batman and yet still feel hopeful for another movie (which is always good for the studio executives). Thus I rate the movie a solid 4 ultra-cool sequences of the Batpod rapidly changing direction out of a possible 5. Thank god you also thought that The Dark Knight was a better film. I have mixed feelings about this one. It's not like I disliked it, but I thought that I would like it more. Yeah - it had that feeling of "It was good, but not THAT good"